Nicknamed the "Gateway to the Nation's Capital," Montgomery County is home to a number of federal agencies and a highly educated and affluent population that has grown increasingly diverse in recent years. Established in 1776, Montgomery County now consists of urban centers like Bethesda and Silver Spring; suburban neighborhoods like Wheaton, Germantown, and Potomac; and scenic rolling farmland interspersed with historic villages, like Brookeville and Barnesville. An additional 50,000 acres of federal, state, and county parkland provide numerous recreational opportunities for its residents. Author Michael Dwyer is a lifelong resident of the county who has always been intrigued by its history and historic sites. As the first historian hired by the Maryland-National Capital Park and Planning Commission more than 30 years ago, he conducted a comprehensive survey of historic resources during the early to mid-1970s. 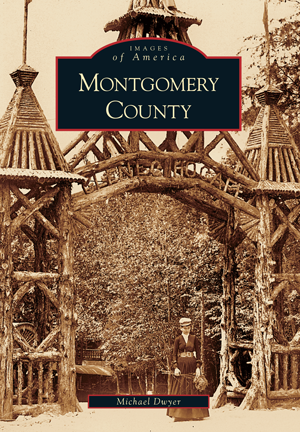 The introductory chapters present a rare visual record of Montgomery County's early development, while Dwyer's photographs document changes that the county has experienced, particularly the transition from its rural past. Despite the loss of a number of these landmarks, many still remain due to citizens' protective interest in their unique county.